Franz Baron von Papen negotiated the concordat on behalf of Germany, even though he ahd been awarded the honourary title of papal chamberlain by Pius X in 1923. He faithfully served both Hitler and tthe pope, but escaped punishment at Nuremberg because his crimes were political. Pius XII's Papal Chamberlains of the Sword and Cape wore the elegant black costume of the Spanish court, with white neck ruff and golden chain. Now called “gentlemen of His Holiness”, they are still appointed for the lifetime of the pope and form part of his entourage for one week a year, during the elaborate pontifical ceremonies. 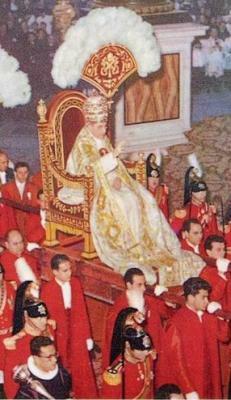 A papal chamberlain can be seen in a procession with Pius XII, at the bottom of the picture. The pope generally picked a nobleman to attend him and the influential German politician, Franz Baron von Papen, proved to be a brilliant choice. Hitler had this former German Chancellor — and papal chamberlain — negotiate the 1933 concordat on behalf of Germany, with the papal nuncio, Cardinal Pacelli. On the eve of war, when von Papen's dual roles became a bit of an embarrassment, Pacelli, who had meanwhile become pope, let the appointment lapse. That von Papen should escape punishment on a technicality was too much for the Soviet member of the Tribunal whose country had suffered so grievously from the war and he protested, even though it could only be symbolic. After that the Vatican waited until 1959 when von Papen’s career was sufficiently forgotten. Then it gave him back his ostrich-feather fan and the honour of attending the pope. 2. Individual Responsibility Of Defendants: Franz Von Papen, Chief Counsel for Prosecution of Axis Criminality, , International Military Tribunal, Nuremberg, Nazi Conspiracy & Aggression Office of United States Chief of Counsel for Prosecution of Axis Criminality ,Volume II, Chapter XVI, Franz Von Papen, U.S. Government Printing Office, Washington,1946, pp. 915-56.